The next Friends of Music recital on November 14 will feature an evening of music for piano and clarinet duo by 20th century composers presented by Joanna Wicherek (piano) and Tiaan Uys (clarinet). Wicherek studied piano, chamber music, historical keyboards and organ in Warsaw (Frederic Chopin Music University), Freiburg (Musikhochschule Freiburg) and Vienna (Universität für Musik und darstellende Kunst). She performs an extensive repertoire internationally with an emphasis on modern classical music. Wicherek has been awarded several prizes including the Standard Bank Ovation Award at the National Arts Festival, South Africa (2014), Grand Prix at the Competition of the 20th and 21st Centuries for Young Performers, Warsaw and the International Competition of Contemporary Chamber Music, Krakow. Currently, she resides in South Africa where she is active as a concert pianist and piano pedagogue. Tiaan Uys is a South African musician who started playing the clarinet at the age of 13 in 2005. He became a member of the South African National Youth Orchestra in 2011. In 2013 he landed the concertmaster position of the National Youth Wind Orchestra and subsequently obtained a Level 4 Diploma in Music Performance from the Trinity College of London (ATCL) in 2014. 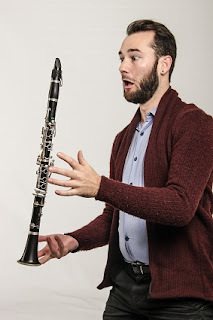 Currently, Tiaan is the clarinet and saxophone teacher at Summerwood Primary School in Port Elizabeth, and also plays double bass in the Eastern Cape Philharmonic Orchestra. Their programme features Eugène Bozza’s Fantasie Italienne; Jacek Grudzień’s Wiatr od morza; Robert Muczyński’s Time pieces; Witold Lutosławski’s Dance Preludes and Francis Poulenc’s Sonata for Clarinet and Piano. The programme also featues Rezső Kókai’s Four Hungarian Dances (No. 2, 1, 4). The Prelude Performer at this concert will be Lungelo Hlophe (tenor) from Lihlithemba High School who won second prize at the recent I Grandi Tenori schools Opera singing competition. The recital takes place on November 14 at 19h30 at the Durban Jewish Centre, 44 KE Masinga (Old Fort) Road, Durban. Tickets R100 (R80 FOM members and R20 students) available at the door.